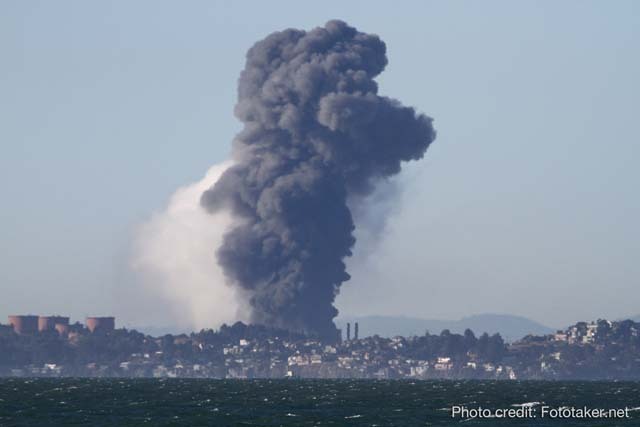 For the second time in five years, a fire at the Chevron refinery crude unit in Richmond has put workers and neighbors in critical danger. By its own admission in reports filed with the State of California Emergency Management System, this industrial disaster allowed for the release of toxic chemicals. As it turns out, 1600 residents were reported to have visited the hospital with complaints of burning eyes, noses, throats, headaches and difficulty breathing. Some of the chemicals released during the fire have been shown to cause lung cancer; most trigger asthma. For more than 30 years Communities for a Better Environment (CBE) has been helping the residents of Richmond to hold Chevron accountable for exposing the community to numerous environmental and health risks on a daily basis. Community members are experts on the impacts of the refinery in Richmond. While we wait for reports from government officials and Chevron’s paid spokespeople, the eyes, ears and throats of our members tell us what we have known for years. This refinery operation is dangerous to the community and needs to change the way it operates. According to the Asian Pacific Environmental Network, (APEN) to compound Chevron’s lack of safety accountability in the refinery fire/explosion, the multi-lingual warning systems that APEN and our allies fought for and won, failed. Many residents reported not being properly notified and are now experiences dizziness, headaches and other symptoms of exposure to toxins. We are documenting community stories so that we can build better protocols in the future. In the first SIX months of this year, Chevron made $13.7 BILLION in profits. Chevron has consistently chosen short-term profit over protection of residents. For decades, Richmond residents have advocated for Chevron to replace its old equipment as soon as possible. Chevron refused to simply update its unsafe equipment and instead attempted to deceive the community and EXPAND its facility in Richmond. The project was really about building the infrastructure to refine heavier and dirtier grades of crude oil. We think that Chevron will trot out the “refinery safety” Trojan horse once again. We can not allow them to do succeed. CBE has been fighting for environmental injustice in Richmond through litigation and community organizing. A CBE lawsuit stopped plans in 2011 for a refinery expansion that would have enabled Chevron to process dirty crude oil. The expansion would have meant an annual increase of nearly a million tons of greenhouse gases and toxic emissions in local neighborhoods—but CBE defeated it with allies at Asian Pacific Environmental Network, West County Toxics Coalition and Earthjustice. •Fund an independent community inquiry into the causes and impacts of this accident. •Provide full medical care and coverage for refinery workers and community members impacted by the fire. •Replace fossil fuel emissions by partially repowering the refinery with solar installed on-site and in the community-providing renewable energy jobs. •Respond to earlier demands from CBE and our allies, including APEN and the West County Toxics Coalition, to replace their aging equipment. •Replace its current leak detection system with one that finds and plugs leaks from dangerous hydrocarbon and hydrogen sulfide leaks.